Well, I don’t buy the assessment that it’s a rip off. But either way, I think Paul gives some good guidance in 1 Cor 6: It’s a defeat that we go to law with one another. Why not rather be wronged? Why not rather be defrauded? (I.e., why not rather embody the narrative of the crucified Christ). In this case, though, what does Mars Hill lose if this is a “rip off” of their brand? It’s not like they are in the same market competing for the same paying customers, right? Blatant ripoff? C’mon. It’s a circle with an M inside. By that argument, they’re both ripping off M and M’s and should be sued by Mars the candy company. I think it’s petty and arrogant to do what they have done. If they have done anything at all, that is. The only proof I have seen is a couple of blog posts, nothing concrete. I thought the exact same thing, it’s a circle with an ‘M’ in it. They’re different fonts, letter placements. The only similarity is the letter and the shape it’s in. Jeff is right on, of MH Seattle thinks that they’re ring ripped off then Mars, the candy company, has as good a reason to sue as anyone. No – they don’t. These are Christians – they shouldn’t be going to court over something like this – ever heard of talking? Ever heard of mediation? That’s where you start if you need a formal resolution between Christians – not with a lawyer’s letter and a threat of court action. The church should show it can deal with disputes better than the world not stoop to this level – just because you COULD sue doesn’t mean you SHOULD. This disappoints me even more. I’m no copyright attorney, but I have been a graphic designer for the past decade and I can say with full confidence that MH Seattle has no right to sue on a copyright infringement basis. The only thing that these two logos have in common are that they are both cropped inside a circle. They are different typefaces, different positioning, different line weight, different styles (one is filled, the other is outlined), etc. This is just silly on the surface, but more so sad to me what it reveals on a deeper level. Why is it that MH Seattle spent good money on attorneys to send this cease & desist letter? Perhaps it’s because they view themselves as a valuable and superior brand worth protecting, just like Walmart, Nike, or Pepsi. Rather than focusing their finances and energies into their community’s needs or spreading the good news, they found it necessary to threaten someone in the Body of Christ because they were offended someone was inspired by their crappy logo. I hope that this Sacramento church keeps their logo. If this why MH Seattle actually sent that letter, and they decide to sue, they will look like idiots when they lose in court. Although it’s probably a bit too late for that. Jesus, have mercy on us. It sounds like no one is exactly sure why Mars Hill chose to bring this to attention. Maybe they really do have good reason to pursure this, maybe not. Either way, I don’t think that it’s any better or “godly” to jump to conclusions regarding mars hill as a whole and their impact on Seattle, and around the world. Slander and gossip is just as awful as suing.. although we don’t even know the exact implications revolving this case. I can assure you firsthand, that God has used Mars Hill to share the gospel around the world, and change thousands of people’s lives by pointing them to Jesus unashamedly. As far as finances, they take finances very seriously and are very public with their budget, even to the point that they have themselves audited annually for accountablility. Mars Hill is not perfect, to be sure, but then again… are you? That’s the whole point of needing a savior. I am excited that God has chosen to use them to share the gospel with so many people! And I pray that God will continue to grow, sanctify and use them. I’d like to give Mars Hill Seattle the benefit of the doubt… and I’m sure there must be some explanation, but this feels like a bit of a stretch. I’m a graphic designer and I deal with treading warily around copyright infringements every day! The only arguable similarity is with the letter ‘M’ and usage of a circular device. Everything from that point forward is completely different though – most noticeably their drastically different styles in site design. Sacramento has more of a modern bright fresh colors look while Seattle follows more of a light grunge dark heavy texture pattern approach. But I admit I don’t know the specifics of the law. Just another example of the overflow of when Pastors become “Cultural Architects” and “Leaders”. Business practice and business concerns overrun the gospel. Weak Sauce! Maybe Musak should be suing Driscoll, then. How about just a *cursory* examination of the “m” logos out there? The order first insisted that the Sacramento church change its *name*. It’s as much about the name as anything. As far as brand goes, I don’t see any impingement whatsoever. The point of the original blog post was not that the Sacramento church should not change its name, incidentally – it was that Driscoll’s church should have approached them differently about it. I don’t think Seattle should sue in anyways. But as a graphic designer and understanding how hard as a designer you work to create to make a logo, that is your personal work using to glorify God. Another church should not rip a logo (which includes being VERY similar to the design). It is a sin, stealing, if your calling it your own. “The very fact that you have lawsuits among you means you have been completely defeated already. Why not rather b wronged? Why not rather be cheated?” (1 Cor 6.7). Just to be clear, it is not a lawsuit, it is a letter from a lawyer and a common boiler plate type letter at that. It seems that by some of the comments people think that the brand is about money – Mars Hill Seattle gives away all of their materials. Yes the logos and website are not exact copies but unless you are picking apart the differences, they look very similar and without having them side by side a lay person might think they are the same. And that to me is the problem. 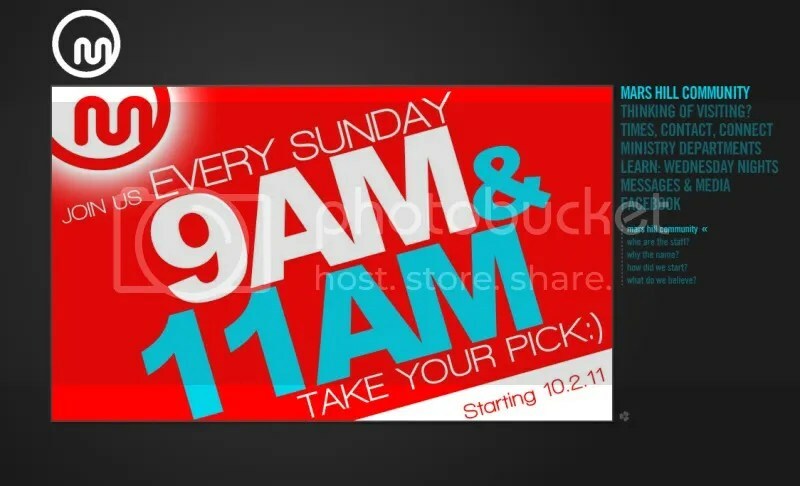 I doubt the Sacremento church had no idea that their logo was very similar to MH Seattle and that is dishonesty. My opinion, and I have never been to MH Seattle, is that the letter from the lawyer is less about protecting MH Seattle and more about protecting the general public from being misled by dishonest people trying to ride on their coat tails. I’m not saying that the pastor in Sacremento is a bad guy or dishonest, but if he is genuinely not trying to mislead anyone then he should recognize the issue and quietly go about changing the artwork. The fact that this has grown as an issue may cause someone to take pause. You can’t threaten someone for using a similar logo. Perhaps since both logos are so poorly designed, many people think they look similar. There’s not much thought put into either one from the beginning, so both end up in the inevitable “throw the initial in the circle” approach. It’d be one thing if MH Sac took the exact logo from MH Seattle, but that’s not what happened. There are completely different. If we are worried about misleading the public, we should collectively send a C&D letter MH Seattle, since they are misrepresenting the church— worrying more about their image and bottom line rather than serving their community and spreading the good news of redemption. I am obviously kidding, but this absolutely burns me to know that Driscoll and crew think so highly of themselves to take this kind of action against another. What does MH Seattle have that must be protected? If they’re life has really been hidden in Christ as Colossians 3:3 says, what do they have that can be taken from them which they feel is not secure in Christ and therefore must be protected by civil legal recourse. Paul’s words to the Corinthian church – “Why not rather be wronged? Why not rather be cheated” – ring hollow, do they not? The kingdom of God needs no protection…it’s victory is Christ crucified. Or…Or is MH Seattle have another kingdom, other than that which belongs to God, which does need protecting? That’s the problem I have. It’s gospel fail! With that being said, I’m not trying to defend the MH Sacramento church. Does their trademark-logo infringe on the trademark-logo of MH Seattle? I guess that is a bit of subjective question. Whether or not the rest of us will ever know, MH Sacramento knows whether or not they have been trying to replicate MH Seattle and they should make the right (moral/ethical) decision. What that is, only they know. But then again, I’m not sure Jesus ever envisioned trade-marks and logos as being so massively important to being his witnesses…which is an entirely different issue. Cease and desist letters are the first step of litigation. I haven’t seen the letter, but I assume that it threatens further action, i.e., litigation if the Sacremento church fails to comply with its terms. All intellectual property law suits start with a cease and desist letter. Usually, the hope is to scare the other party into compliance without filing a law suit, but the threat of litigation is always there. This is sad,,, more of Christians being Christians. I’ve had to quit calling my self a Christian. It’s become a dirty name. I attempt to follow The Way, which this Driscoll seems to have stumbled off of. This is more proof that the church has become big business. Thanks for comparing the images. 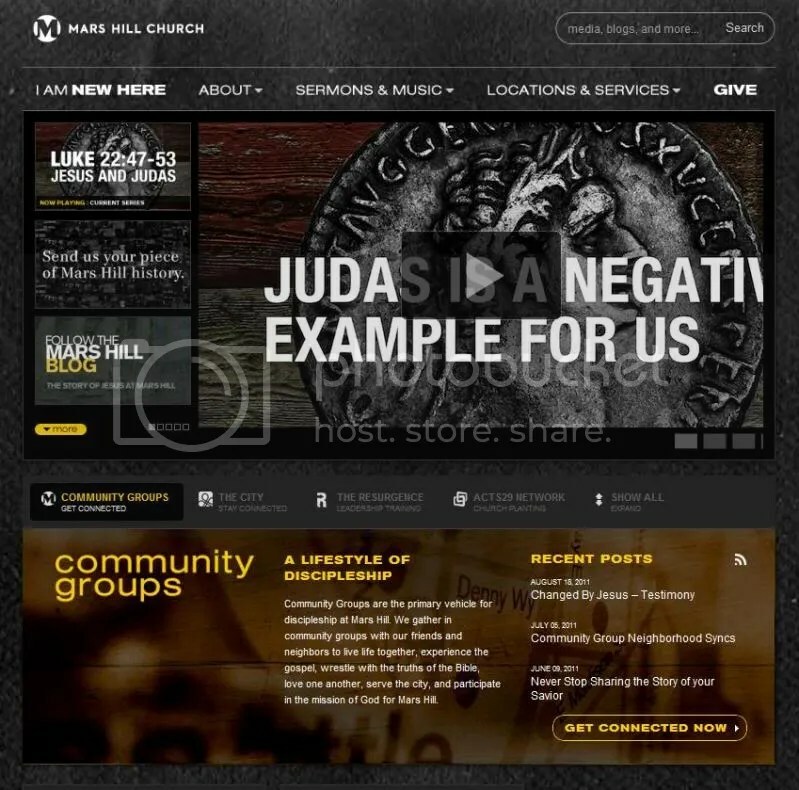 The two sites have a black background. The visual impact is different. The brand is strikingly different. So how does the action make more sense now? Copyright infringement?! Calling this a “sin” is a real slippery slope. I’m much more troubled that a church would treat its name like a consumer product. When I heard of Mars Hill Church in Seattle I remember wondering if it was affiliated with the Audio Tapes or the Graduate School — it’s bound to happen. There’s a First Baptist Church in every town, and somehow we survive. So, let me see if I understand this: Mars Hill church in Seattle notices that another Mars Hill church in Sacramento has what might be construed as a similar website logo, and thus decides to send a cease-and-desist letter? And how is that helpful to the Christian faith in any way? It only seems to benefit one group, Mars Hill Seattle, by establishing their brand as something that can’t be mimicked. But regardless of whether people want to mimic Mars Hill Seattle or not, there is a more basic issue: Christianity, as far as I can tell, doesn’t get caught up in trivial issues like this. But a BUSINESS does. So, once again, it appears that church and the gospel are secondary to a specific model of ‘church’ and ‘gospel’ that appear to be guided more by marketing than by faith in Christ. Does this not seem obvious? If so, how is it that Mars Hill Seattle can’t see it? We have a biblical injunction to not go to court against one another. In1 Corinthians 6:1-7 scripture states it is better to be wronged than to take one another to court. When do we as Christians begin to live this out? When do we set an example to the world in both word and deed? Okay, artwork would be a copyright issue, not a trademark. However the way his artwork is being used it actually encompasses both. So, if Mars Hill (Seattle) weren’t a massive church, there’s no way that they’d be even looking around at where to send cease and desist letters, let alone doing it. My home church’s logo is a stylized steeple. I’d bet a zillion other churches have the same. Should our elders’ board start to surf the web looking for other steeple logo-churches to threaten? You know, I actually like a lot of what Driscoll has to say. I don’t always agree, of course. And sometimes he is way off base (or takes things to far). But he has a ministry. …but stuff like this erodes that ministry like you wouldn’t believe. I, for one, am flabbergasted by this whole thing. As one of the pastors at a completely separate church who also received a C&D letter, I can assure you it is about more than a logo, it IS demanding a name change as well. both logos are a freakin’ letter “m”. how creative is that, really? my last name starts with an “m” so I’m pissed too. maybe McDonald’s should sue them both; after all, their logo is a letter “m” as well and has been for a lot longer. truth is, this is ridiculous. another ridiculous thing coming from Mars Hill Seattle.